Working really hard on doing inventory all my latest purchases. However today I took a break at 5pm because there was a garage sale not far from me. I live at least 5 miles to the most northern part of town, nothing is ever close for me. This one was just a mile from me in rural Bismarck. Glad I did. Yes I found another suitcase. 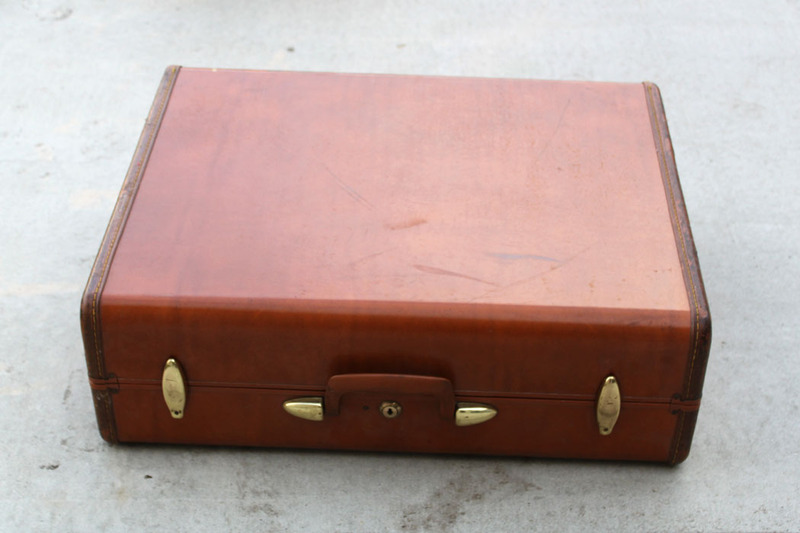 If you follow my blog you know I love old suitcases. Thanks to my friend, Kristi, from Traveling Trunk. This one is amazing. It is Samsonite Style 4637. But look inside. It is so clean it has the doors to hold the items in each side, plus 4 hangars. This one is so cool. Found this awesome creeper stool. Not sure if that is what it really is called or not, but just fell for this little guy. I think it is the wheels on any creeper that always get me. Very inexpensive box of old wood hangars. There are some really old ones in there. 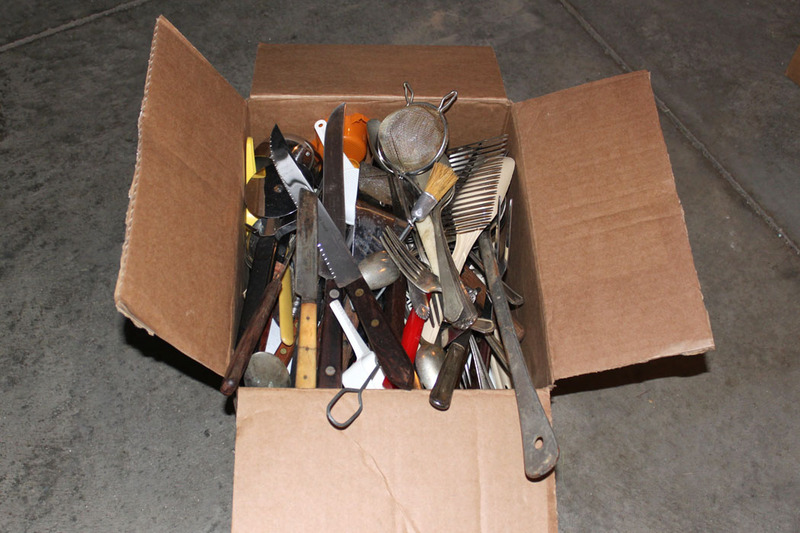 And a box of flatware. The price was right so I thought I might have fun looking for silver, bakelite and other old, interesting pieces. If I do not find anything I will donate it all to the local thrift store. I don’t think I have shown you this lovely Chip Bowl. Love the design. 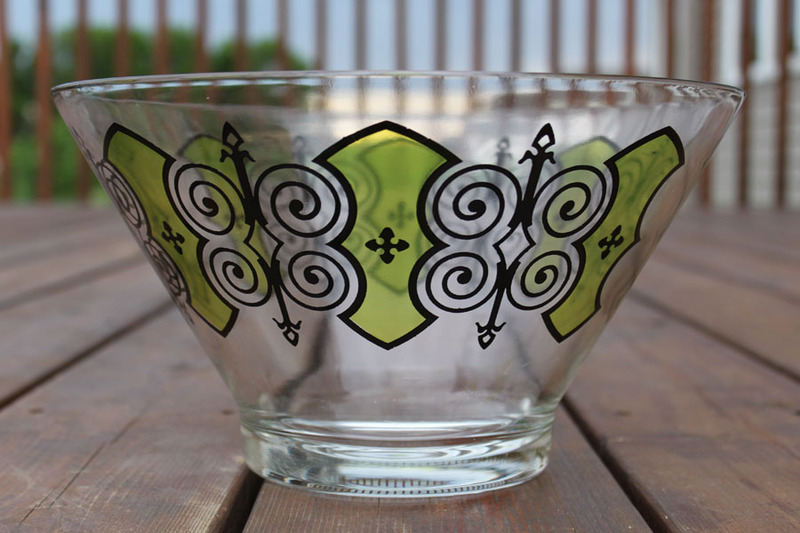 It is Espanol from Anchor Hocking. Recently picked up these. The auctioneer said their were Industrial bread pans. But I am not sure. They would make lovely shelves on the wall or a great storage piece in a craft room. It easily hit a hundred degrees here today. I am sure it was hot where you are too. Don’t forget to keep drinking lots of water. This entry was posted in Junkin' Pickin' Finds and tagged bread tins, suitcase by Karen Grosz. Bookmark the permalink. I just found your blogg, while sarching for something so thought i would take a look. I like alot of what i see. 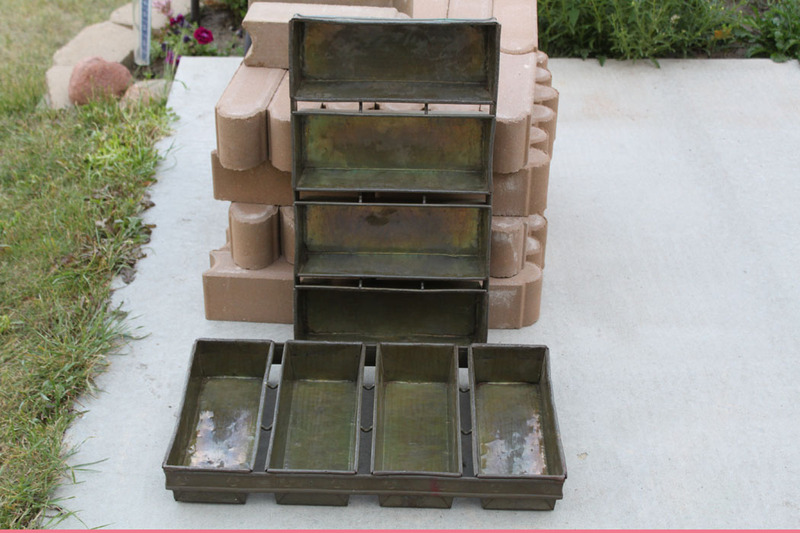 I have some of this type of pan and mine say RICHS on them, I was always told they were old butter molds. I do use mine for baking breads. They make a great gift size loaf. thanks for checking out my blog and then commenting. I love to “meet” new people and hear from old friends as well. I am going to look more closely for a mark. Maybe it is there and I do not see it. I had not thought of butter molds. Maybe I can search for that. They seem too large for that, but maybe not for restaurants. Love that you use yours for baking bread. I just never bake bread. I do make zucchini bread but that is it. Again thanks for stopping by. Hope you visit again. you know i did look at yours again, and they do seem bigger than the ones I have and they mark on mine is very big…so maybe you do have real bread pans, either way I love them both. And your idea for storage is a very good one. 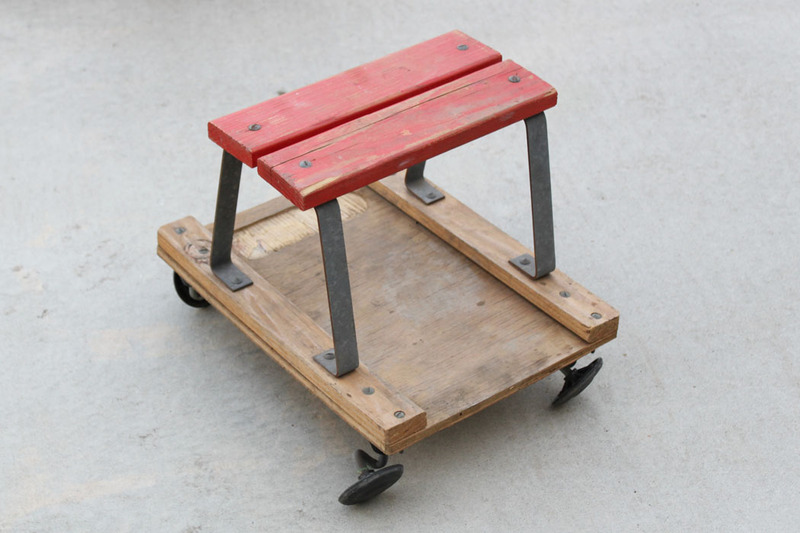 I love using old things in new and different ways. Smaller ones would be oh so cool, too. I love hearing about others and what they have. Thanks. Oh, you found a lot of great vintage thrifted treasures! Love them all! I will be featuring this post on this weeks TTF party. I hope you will join us again and stop by to grab the “I was featured” button for your blog! Thank you for sharing at TTF last week. I hope you are having a fantastic day! Thanks Diann, I plan to link up when I can. Enjoying all the links that join your party. thanks so much for featuring my post. Looks like you hit some great scores! 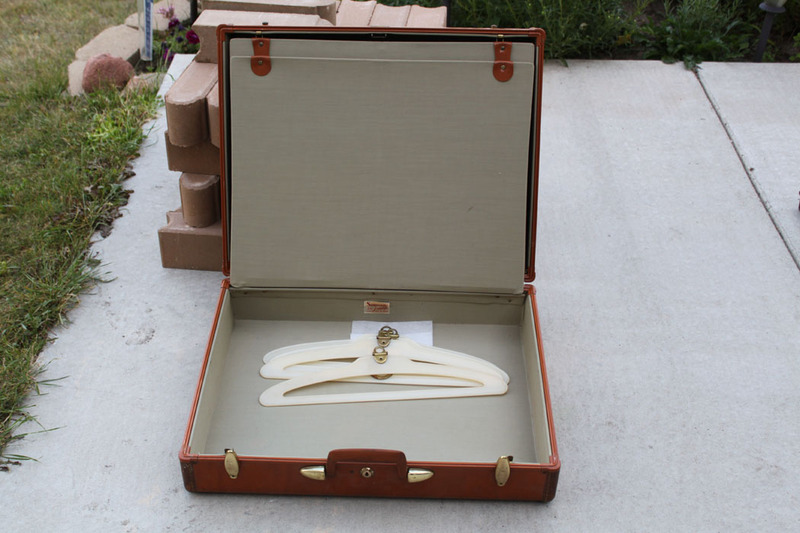 Do you have a different link for the Traveling Trunk you mentioned? The current one goes to a Facebook login and I don’t do facebook. Thanks! thanks for commenting. Kristi does have a blog but does not post often there. She posts things on facebook regularly. Hi, Looks like you had an awesome Thrifty Excursion and fairly close to home. Things that catch my eye in the” box of flatware” are the small “tea strainer” ( my mom has one just like it which I will inherit), the wooden steak knife, and the Angel Food cake slicer! The big glass bowl is so pretty and colorful. By the way, I saw bread pans like that used at a little lunch place called “Soup de Jour” ;however it has been closed for some time 😦 The ladies baked some wonderful tasting breads like tomato bread and poppy seed bread. 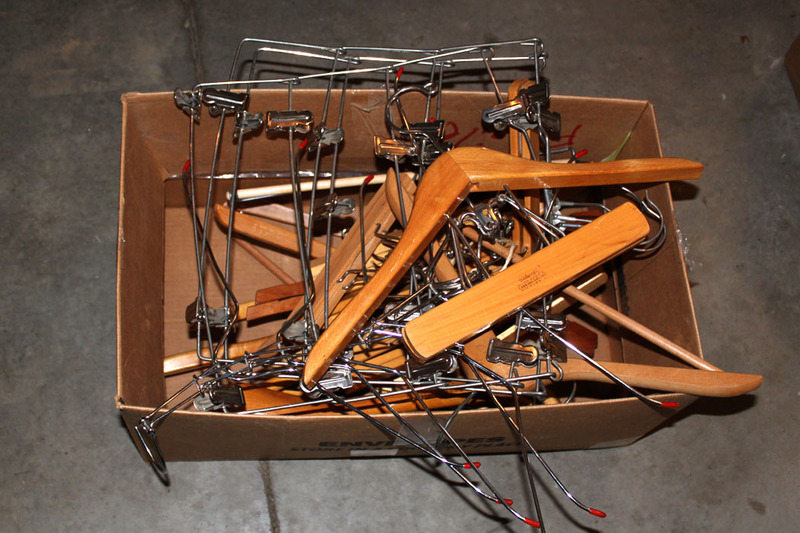 We find those wooden hangers pretty often at a local Church flea market and my husband uses them for his suit jackets and trousers. The closest Thrift/antique store to me is in Englishtown, N.J. and wish I could have more time to get there then a couple times a year. 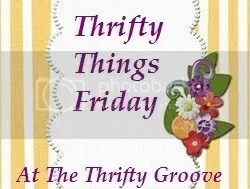 It really was a great thrifty time. So glad you will inherit your Mom’s tea strainer. I love the little things I have from my Mom’s kitchen. The little lunch place sounds yummy, thanks for letting me know they used these type of pans. I am more and more sure that is what they really are, industrial bread pans. And let’s hope a thrift store opens near you soon. Thanks for all your comments. They made my day.